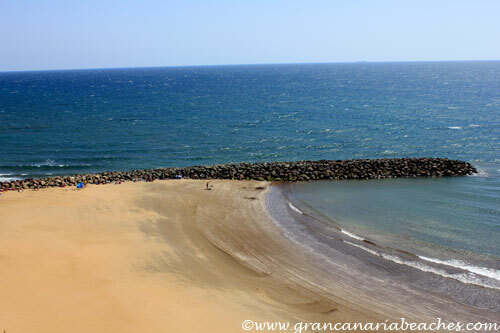 Playa del Ingles (together with Maspalomas) is well known around the world and is one of Gran Canaria’s most popular beaches, among the tourists of all ages. Millions of them visit it, every year. 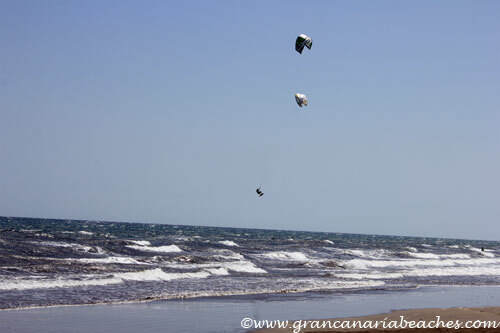 It is located between the San Agustin and Maspalomas beaches, and has great weather all year long. 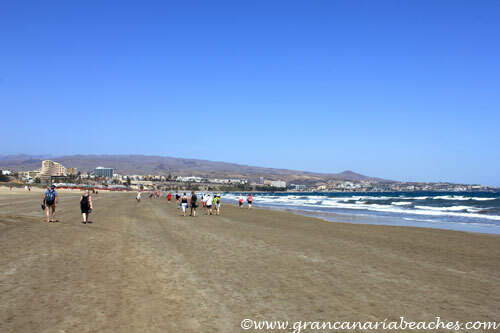 Playa del Ingles saw the birth of tourism in the early 1960’s. Since then, it has been kept in great condition, thanks to the co-ordinated efforts of government bodies and local businesses. There are plenty of hotels, restaurants, and shops built near and next to this beach. Some of the hotels haven’t been renovated for some time, so it is always a good idea to check out the hotel reviews before booking. 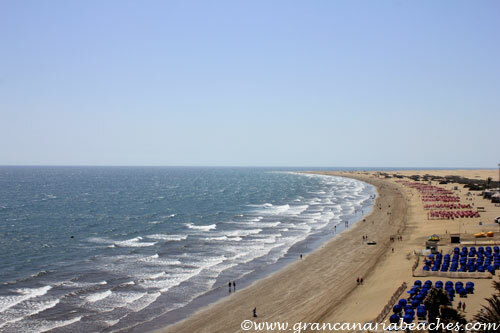 Playa del Ingles is almost three kilometers long. It is full of fine golden sand, which changes to a dark gray color when the sea water wets it. The sand is easy to clean-off after returning from the beach, and because it absorbs the sun’s heat, it helps tired muscles to recover. The long coastline, makes it a great place to go for a stroll, even if the tide is high, and I would recommend it, especially because of its big area, which gives everyone plenty of room on the sand to keep towels, etc. and yet not be too close to other people who are also enjoying this beach. The sea water has a high concentration of salts. The sea salt and different types of algae (during certain months of the year) make a combination that is great for skin care. Doctors also recommend this beach for people who want to improve their breathing, because of the cleanliness and salinity. 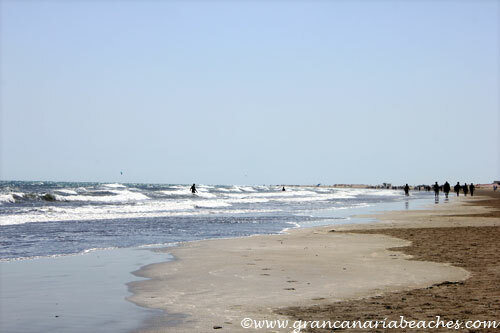 The shape of the shoreline reduces the force of the sea currents near the beach but at the same time allows the waves to clean out the area (this is a plus point compared to other beaches that are more enclosed). The waves come and go, and one can do jogging or play around near the shore. It is always a good idea to keep in mind the colour of the flag each day, to know the sea condition, before going for a swim. In the photo below, you can see a yellow flag on a windy day of March. 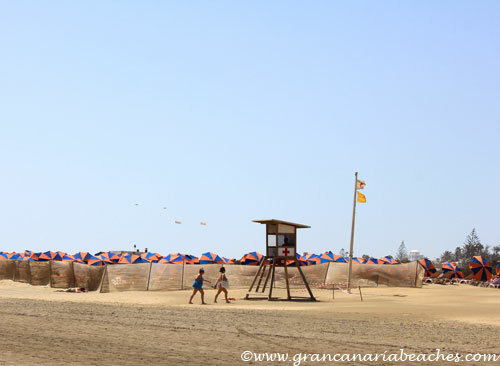 Playa del Ingles has one of the world’s quality certificates, the blue flag. This flag guarantees compliance with strict quality requirements such as accessibility for the disabled, points of drinking water, health care services for tourists, and cleanliness of the sea water. This flag can be found in the world’s best beaches in thirty countries. It is granted by the Foundation for Environmental Education, and the quality of each beach is reviewed every year. If it doesn’t meet the quality standards, the flag has to be taken down. People take advantage of the great climate to practice all kinds of sports, on this beach.